Visitors - the people who visit, listen to, touch, smell, play with, read, and interact with our design creations - are the most important consideration in our work as exhibition developers. Community consultation, concept and prototype testing, and evaluation help us to ensure that our work connects with the people it is meant to reach. Vilnis Cultural Design Works is a full service exhibition research, planning, design and production company, creating memorable turn-key exhibits to delight and inspire your audience. We communicate through design to tell stories, bring home messages, and actively engage visitors in the exhibitions and environments that we create. 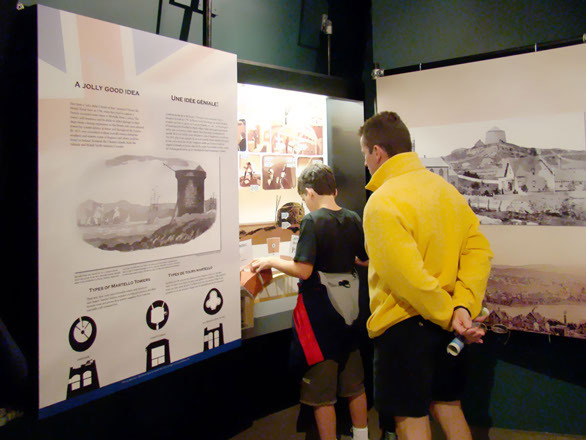 Visitors participate in a collaborative family effort to build a keystone arch at the Parks Canada Carleton Martello Tower Visitor Centre in Saint John, New Brunswick.